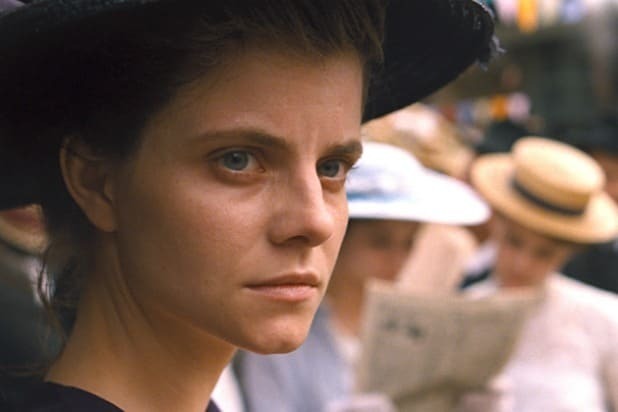 Nemes had one of the most auspicious feature film debuts in recent memory: His first film, “Son of Saul,” was one of the rare debuts to land a spot in the Cannes Film Festival’s main competition lineup, where it won the Grand Prize (runner-up to the Palme d’Or) before going on to win the Oscar for Best Foreign Language Film. “Son of Saul” was a remarkable combination of subject and form, a harrowing and immersive Holocaust movie whose camera never left its protagonist, a Jewish prisoner enlisted into the sonderkommando to help the Nazis exterminate his fellow prisoners. The film is a hard act to follow, and Nemes doesn’t really try with “Sunset.” But his filmmaking style picks up where his earlier film left off: if the camera isn’t on the face of lead actress Juli Jakab it’s on the back of her head, and the few wide shots invariably end up right back on Jakab. The style is disorienting, but it makes sense for a character who is disoriented. Irisz Leiter has come to Budapest looking for a job in the hat shop started by and named for her parents, who died in a fire when she was two. The current management is reluctant to hire her, and soon she learns that she may have a brother she never knew about, who became a murderer and then disappeared. Irisz spends the next two hours trying to figure out what’s going on, as do we. She’s opaque but persistent, trying to find a way through a landscape of pregnant pauses and portentous glances and a chaos that is increasingly revealed, as the chaos of an old order about to crumble. This is the Austro-Hungarian Empire on the eve of World War I, with a corrupt monarchy and class struggle undermining the veneer of civility. Irisz is largely a passive character, but she keeps moving forward, and Jakab is always fascinating to watch — which is pretty much a necessity, considering that we spend the whole movie watching her. Sprawling where “Son of Saul” was focused and frustrating where it packed a punch, “Sunset” is nonetheless an audacious step for a director who prefers immersion to exposition. It’s not easy, but it’ll get under your skin.